NASCAR Cup Series driver Jimmie Johnson (48) greets fans during driver introductions prior to the NASCAR Cup Series auto race at the Martinsville Speedway in Martinsville, Va., last month. Johnson is running in today’s Boston Marathon. 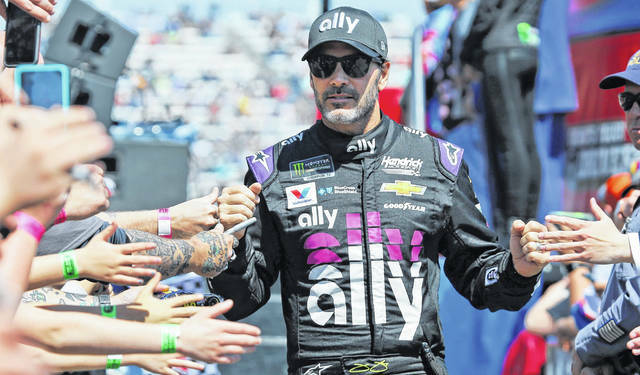 BOSTON (AP) — Just because he won’t be surrounded by 3,300-pound cars traveling at more than 200 mph doesn’t mean Jimmie Johnson will be able to relax when he runs the Boston Marathon today. https://www.limaohio.com/wp-content/uploads/sites/54/2019/04/web1_JimmieJ.jpgNASCAR Cup Series driver Jimmie Johnson (48) greets fans during driver introductions prior to the NASCAR Cup Series auto race at the Martinsville Speedway in Martinsville, Va., last month. Johnson is running in today’s Boston Marathon.